A brand new line of designer African American Interior Floor Mats - floor art for multipurpose use! Featuring genuine artwork from your favorite artist, Gbaby, that will uplift and inspire your home. 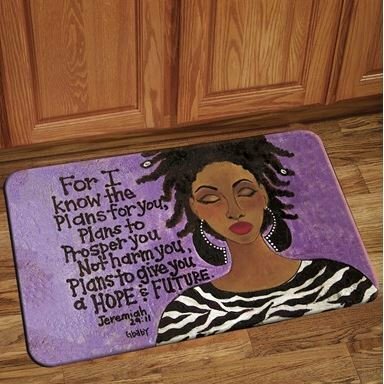 This unique design is a perfect floor mat for any area of your home, church or business. Ideal home decor item for indoor entrance, kitchen, bathroom, etc. Made with polyester on top and finished with a rubber backing to keep the mat in place and to prevent slipping. Extremely light weight. Hand wash only.